Looking For The “X Factor” This Halloween? Want To Create Something Different? Not A Problem. 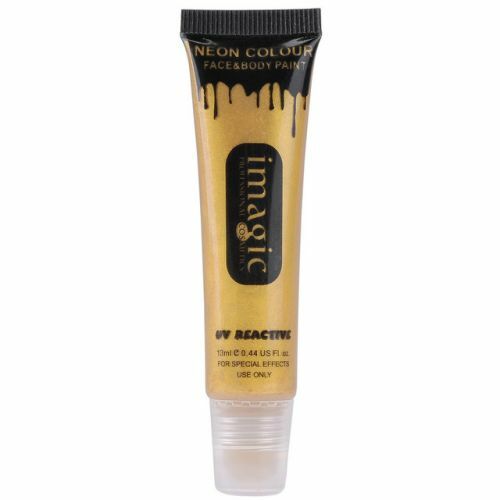 With Imagic Face And Body Paint, You Can Unleash Your Creativity And Let UV Lighting Does It’s Magic! Available In Eight Vibrant Colours And Does Not Contain Artificial Fragrance. Easy To Apply And Washes Off At The End Of The Night. Does Not Contain Artificial Fragrance And Is A Natural Mild Wax Scented Product Made From Organic Beeswax, Carnauba Wax And Coconut Oil Containing Vitamin. Available In Eight Vibrant Colours, It is Perfect For Halloween, Clubbing Events, Raves, Fancy Dress And Anywhere With UV Lighting.